The clearing of forests inhabited by indigenous people in Indonesia's Papua* Region by agribusinesses is fuelling conflict in the southern Merauke Regency, say campaigners. Over the past four years, at least 74 people have died in the village of Baad alone - one of more than 160 across Merauke- due to infighting between communities created by disagreements over the sale of land to agribusinesses, and police brutality, according to Leonardus Maklew, a Baad resident who has been representing nine Malind villages in negotiations to defend their land from an Indonesian sugar cane plantation since 2010. “The most serious consequences have been human deaths. Up until now, the police, companies, and military never tried to understand our needs and our struggle,” said the 35-year-old ethnic Malind man. “Police and military personnel routinely accompany companies when they come to ask the Malind to sell their land. It is a form of intimidation,” said Sophie Chao, a project officer with the Forest People's Programme (FPP), a non-profit organization registered in the Netherlands that campaigns for the rights of indigenous peoples of the tropical forest facing environmental destruction and human rights violations. Since 2009, when the local government initiated planning for the Merauke Integrated Food and Energy Estate (MIFEE), a mega development project aiming to convert more than a million hectares of forest to agribusinesses in Papua, at least 12 corporations have moved into areas inhabited by an estimated 116,500 indigenous peoples generally known as the Malind, who are struggling to survive in increasingly degraded, deforested environments. While police and military brutality against indigenous Papuans is nothing new in this resource-rich, former Dutch colony, violence between communities on this scale is unprecedented, residents say. “The government says we are just a hot-headed people, always fighting, but it is worse now. Tools that used to be used for hunting are now used against one another,” said Maklew, explaining that bows and arrows, and knives, are all commonly drawn during fights, which have occurred at least once a month since corporations started (in 2009) trying to convince villagers individually to sell their land, bypassing customary collective decision-making processes. Company spokespeople of PT Anugerah Rejeki Nusantara (ARN), a sugar cane plantation owned by the Wilmar International Group (WIG) headquartered in Singapore, often co-opt tribal leaders, paying them a salary to convince the other villagers to sell their land, according to the FPP, and without giving full information to communities that they will not see their land again, according to Rainforest Foundation Norway, an NGO that campaigns for the protection of rainforests and their inhabitants. WIG strongly denies the charge. “Wilmar pledges to respect and recognize the long-term customary and individual rights of indigenous and local communities,”stated WIG in a public statement on 5 December 2013. IRIN repeatedly attempted to contact WIG by phone and email but the company declined to comment. However, in some cases, the amount offered for the land - 10,000 rupiahs (less than US$1 per hectare) per year - is not even enough to buy a packet of cigarettes in Indonesia, say activists. And then there is the whole issue of demarcation. But according to activists, the situation on the ground has not changed. “If anything, the situation in Papua is intensifying,” said Chao. The Malind demarcate their land in the 45,000 square kilometre area using rivers, stones, and certain trees, but as some villages sell their forests - such as Zanegi village, which ceded 300,000 hectares to an Indonesian timber company in 2009 - traditional means of demarcation are changing, leading to confusion and contributing to a rise in social tensions. “One of the most tragic outcomes where corporations are land grabbing, is that communities have become bitterly divided,”said Marcus Colchester, the director of FPP, who explained that the villages resilient enough to hold out from selling often face “terrible consequences” including intimidation, harassment and beatings, and sometimes even deaths - all of which are committed with impunity in Papua due to the political legacy of separatism. Communities feel they are unable to speak out against the corporations and military to defend their forests, and to organize to campaign for it, without being labelled by the local authorities as separatists, and becoming vulnerable to police brutality. “Whenever we stand up to raise our voices, we are labelled as separatists,” Lucia Erni, 46, a woman from Sarui village and co-founder of the Nyam Noken, or Papuan Women's Rights Network, a three-year old local advocacy consortium aimed to empower Papuan women against gender-based violence. 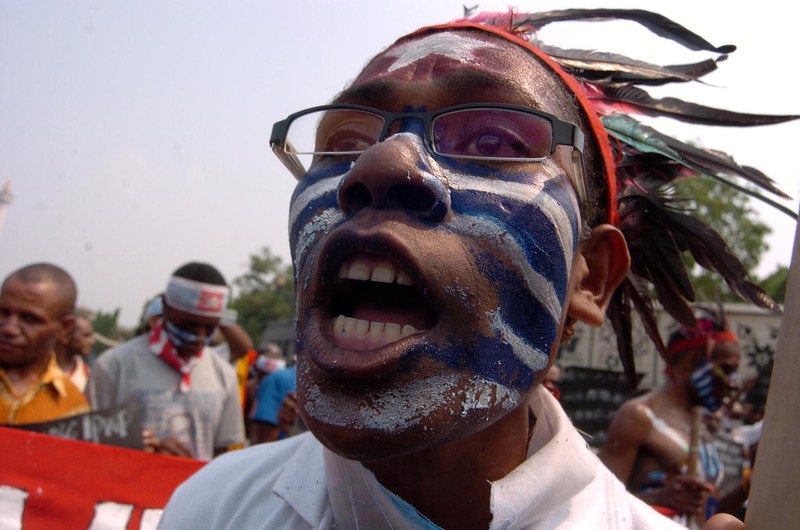 Papua has witnessed a low-level separatist insurgency since the 1960s when it was officially annexed by Indonesia in 1969, while activists continue to voice their discontent with the Jakarta government, calling for greater autonomy. Forty-five thousand Indonesian troops occupy the region to control the separatist movement, which has been ongoing for half a century and seen an estimated 500,000 Papuans die at the hands of the military, according to the International Parliamentarians for West Papua (IPWP), a political UK-based support network for Papuan self-determination. “The police and military are already around us, and we are stigmatized by the independence movement. They justify beatings and arrests by saying we are separatists,” said Maklew, who has been imprisoned five times since 2010. One conviction was for standing up to police after 23 women from his village were allegedly raped by the military. “We are not separatists, we are just trying to defend our lands and way of life,” he said. Those Malind who try to defend their land run the risk of clashing with military personnel, and are arrested and put in police custody, where they are often beaten and tortured, rights groups say. At least 47 Malind land defenders have died in Merauke in the past four years alone, while under police custody, according to Maklew, who says he himself has been beaten by police and punched in the face. Environmental conservationists say indigenous people are one of the only barriers against global deforestation and industrial interests. “When our peoples’ rights are secured then deforestation can be halted and even reversed,” stated the recently released Palangka Raya Indigenous People's Declaration, the result of the gathering of more than 10 indigenous groups worldwide, including the Malind, on 19 March 2014 to discuss how to assert their rights. “Now we have to walk more than one kilometre to find a forest to gather sago [a major staple food],” said Nyam Noken’s Erni. And so far, there have not been enough jobs to go around. “Indigenous people, who have lived on these lands since time immemorial, deserve to be part of the decision-making process,” said Vicky Tauli-Corpuz, the executive director of the Tebtebba Foundation, explaining that not doing this takes a toll on communities. Women, who are traditionally responsible for gathering food for the family, now have to leave their children and husbands from dawn until dusk in order to find forests where they can gather enough roots, sago, and vegetables to last a few days. “It creates problems inside of the family. The men are angry and the children are left alone all day,” said one local woman who went by the name of Lucia. 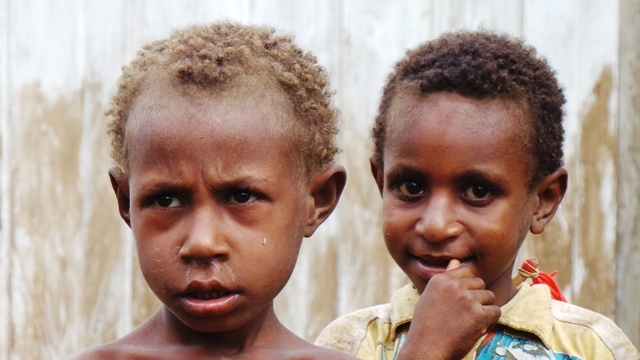 Locals say the most deadly disease now is Tik - a Papuan word for an invisible disease that can be felt but not seen, used to describe the “seeds of mistrust that are being sown between and within communities,” said Maklew. “In Papua, land is like our mother, it gives life and continuity to the generations. Especially women, we are the caretakers of the forest. We cannot be separated from the forest and the land,” said Lucia. According to the FPP, since 1900, Indonesia has lost over half of its forests, and is currently losing an estimated two million hectares more per year, mostly on the traditional land of indigenous and local communities. The country’s constitutional court recently declared that the state should pass ownership of some 40 million hectares of customary forests (30 percent of the country’s forests) to indigenous communities. Though the government has yet to do this under pressure from palm oil, logging, mining, pulp and paper and other project interests, forest and indigenous proponents say it is a step in the right direction. “Customary rights are guaranteed in the constitution. However, over the years, conflicting laws and regulations that govern tenurial rights have compromised these rights,” said Nirarta Samadhi, the deputy head of the President's Delivery Unit for Development Monitoring and Oversight of the REDD+ Task Force Working Group on Forest Monitoring. “This decision is fundamental in the effort towards recognizing indigenous rights in Indonesia,” he added.